​Area rugs a highly specialized decoration – some people like to own contemporary designer rugs while others prefer an Oriental or Persian look. Most of these rugs have fringes, however, that tend to be made from wool or cotton – they make up for the most sensitive part of the rug and tend to deteriorate at an early stage. Fringes are also the area of a rugs on which spills and dirt becomes obvious sooner than on any other – many fringes are of white or cream color and therefore make the dirt, dust and stains very obvious. We have trained cleaners to clean all parts of a fine area rug, including its most sensitive one. We use environmentally-friendly and mild cleaning solutions to clean these tassels, as fringes that are cleaned with harsh chemicals tend to deteriorate further and solutions containing bleach are specifically damaging for fringes of any rug. In case of any ink bleeds, we'll start with an ink blocking solutions so that the damage does not worsen once our special cleaning agents are applied on it. Like the rest of your area rug, its fringes will receive a tailored customized treatment. We're aware that certain fringes can even be damaged by vacuuming – while we use heavy-duty vacuums and air circulation techniques to fully dry fringes of the rugs, we do so with the utmost care for their integrity. After drying the rug we use our special brushes that contain soft bristles to untangle any knots on the fringes, ensuring their preservation in the months and years to come. If you've invested in a fancy area rug with a lot of delicate fringes on all sides, then you can understand the worry of a rug owner when they see dirt accumulating on them over time – how does one clean them without damaging them? Begin by protecting the floor to ensure that no damage occurs to it due to moisture – this can easily be done by placing a tarpaulin cover under your area rug or taking it outside. The next step is to gently dry-scrub the fringes of your fine area rug using a brush with soft bristles to remove much of the dust and debris between each fringe, although you should focus on using the slowest movements possible. After that, add a tablespoon of ammonia to a large cup of warm water and dip a soft sponge into this solution. Use this sponge to gently wipe off any dirt from the fringes, ensuring every fringe is washed evenly. Add vinegar to warm water, immerse a clean cloth in it and rinse it out. Use this cloth to dry out the fringes as much as you can. Once done, leave the rug to dry on its own in a well-ventilated area. By this point, you'll probably notice that not all of the damage from the fringes is gone even if you've repeated this procedure multiple times. This is because the fringes of a fine area rug often feature complex weaving that can be immensely difficult to clean without damaging them. Likewise, if you feel unwilling to try a DIY method just to get mediocre results, you can just as easily have us come over and pick the rug up in its dirtiest state. We pride ourselves on offering our customers a hands-off approach, and part of this involves eliminating the need for our valued clients to experiment with different cleaning methods only to get lackluster results. If your fringes are in a vulnerable state, we advise you to avoid the aforementioned method altogether and have us take care of the entirety of the cleaning. 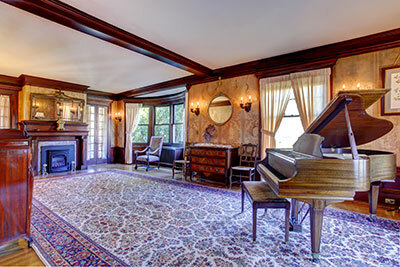 Our experts know exactly how to preserve an expensive area rug's fringes, even if they have systematically suffered damage for months or even years. It's often said that fringes are a rug's most beautiful part – while this depends on a person's individual sense of aesthetic, it's safe to say that they might very well require the most care out of any of the parts. Let us provide your exquisite area rug with exactly this type of care, starting with the beautiful yet vulnerable fringes that, in our opinion, should never be cleaned by anyone other than true masters of their craft.